This flourless cake, with a satisfyingly crumbly, moist and dense texture, is perfect for enjoying over a cup of tea with friends or packed in a cake tin to take on a picnic. 1. Preheat the oven to 160ºC, gas mark 2. Grease and base line a 23cm springform cake tin. 2. Whisk the Flora and 200g of the sugar in a large bowl until creamy. Beat in the eggs and the vanilla extract. 3. Add the polenta, almonds, baking powder and orange zest and mix together. Gently stir in the raspberries. Spoon into the tin, scatter with flaked almonds and bake for 50 minutes until set and lightly browned. 4. Meanwhile, place the orange juice and remaining 100g caster sugar in a small saucepan and simmer gently over a medium heat for about 10 minutes until thickened and syrupy. Remove from the heat and stir in the liqueur, if using. 5. Prick the cake with a thin skewer and spoon over the syrup. 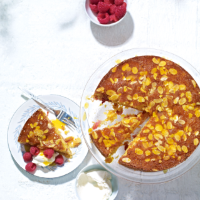 Leave to cool in the tin then slice and serve with a spoonful of mascarpone and a scattering of raspberries. For extra zing, try using lemons in place of the oranges.